As the deadline for my 101 Things List draws closer (October 28, 2016), I'm trying to refocus on checking some things off. Sadly, most of the ones left are really difficult ones that ain't happening, like Have Tea in London or Go to Scotland. But there are a few easy ones that I've just been putting off. Like this one. 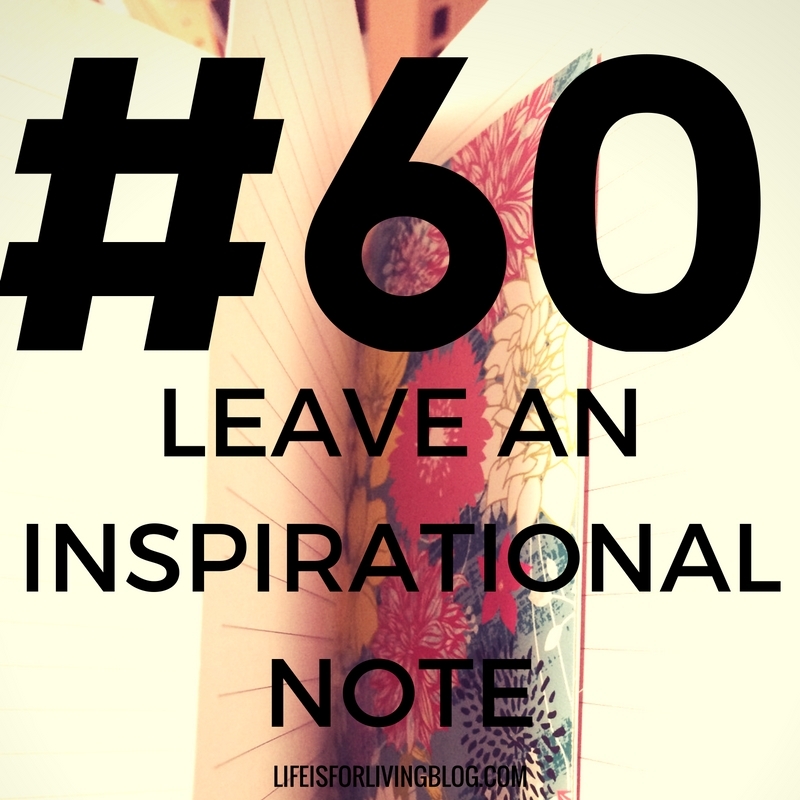 #60- Leave an Inspirational Note for Someone to Find. I was pretty excited about this because of the potential to brighten a stranger's day, and maybe even influence the course of their life. Sure, that's a little dramatic, but there's an air of mystery to this one that holds so much magic. You know what I mean? I tried to imagine myself finding a random, unsigned note and I thought of how it might encourage or motivate me to make changes in my life. While some people might judge or think it was dumb and simply throw it in the trash, I really think God could put it in the hands of the right person and use it for something cool. And that's what I prayed for. It sounds weird, but I prayed for God to give me the words to put in this little card, and I just kind of followed my heart as I put pen to paper. I won't share what I wrote here because that kind of defeats the purpose, but I'll tell you what I did. I hand-wrote my little note in a pretty blank card that I got from Target. Then I carried said note around with me in my purse for about a month, trying to figure out where to leave it. Every time I went out, I looked around for opportunities. I tried to think, Where might someone be needing encouragement? I finally settled on a place that resonated with me. The journal section in a large bookstore. Think about it. Nothing holds more possibilities than a blank book. And only someone with the desire to fill one up, perhaps someone with an imagination or someone in need of making a fresh start, would buy or receive one. I selected the journal with the most inspirational cover art, opened my purse, extracted the note, and sneakily slipped it inside. Ever so cautiously, I snapped this photo; I wanted to have proof. Then I shelved the book and dashed away with an embarrassing surge of adrenaline and probably a dumb grin. I strolled around the store for a while, keeping my eyes on the journal section and any shoppers who headed toward that area. Would that lady over there be the recipient? Was that guy in the striped polo the one who needed an encouraging word today? Not knowing simultaneously thrilled and perturbed me. Anonymity is what drives this action. This simple little action, one stranger lifting the spirits of another, in a dark, depressing, evil world. In a place where we're constantly frightened of people we don't know, it's encouraging to find that there are still nice people out there. People who don't even require recognition or gratitude. That's why I put this task on my 101 Things List. I've always wanted to do things like this, but I needed a push. My own fears, social anxieties, introversion, and well, laziness, constantly keep me from being a positive force in the world. I don't help people unless I'm getting paid to. I don't encourage people because I'm usually too scared to talk to them. But this list keeps me accountable and forces me to step outside the ol' comfort zone, even if it's something as simple and social-contact-free as hiding a note for a stranger.